Dive In To The Summer! A diver who competed in the London Olympics and two gymnasts set to star with the Cirque du Soleil are among the team performing in a brand-new show at Pleasurewood Hills. The trio are part of a six strong team of performers who have brought their show to the park for the whole of the summer. With an impressive range of diving, gymnastics and parkour experience between them, the international team is set to wow audiences with their unique show. Julian Sanchez was a member of the Mexican National Diving Team for 16 years and came 7th when he performed in the 2012 Olympics. He’s joined by fellow Mexican performers Edubiel Alpizar, a professional high diver and stunt man who is also a trained vet and scientist and Alain Carreó, the show captain who is no stranger to live dive shows as he has been performing in them for over 20 years. Completing the act are David Jesus Peá, a Spanish Champion on both springboards and platforms, Renato Rodrigues Queiroz, a Brazilian and Danish champion on double mini trampoline and Gabriel Oliveira de Paula Costa who trained at the National Circus School in Brazil. After performing at Pleasurewood Hills both Renato and Gabriel are set to take to the stage with the Cirque du Soleil later this year when they will be travelling to China and Germany respectively. The experience of the team together with perfect timing and nerves of steel make for an impressive show which tells the story of a Mayan tribe and their search for a new leader which hits some unexpected surprises. As well as featuring platforms of different heights including one set at 25 meters, the show also has a choreographed trampoline routine and one or two special stunts that may have audiences holding their breath. 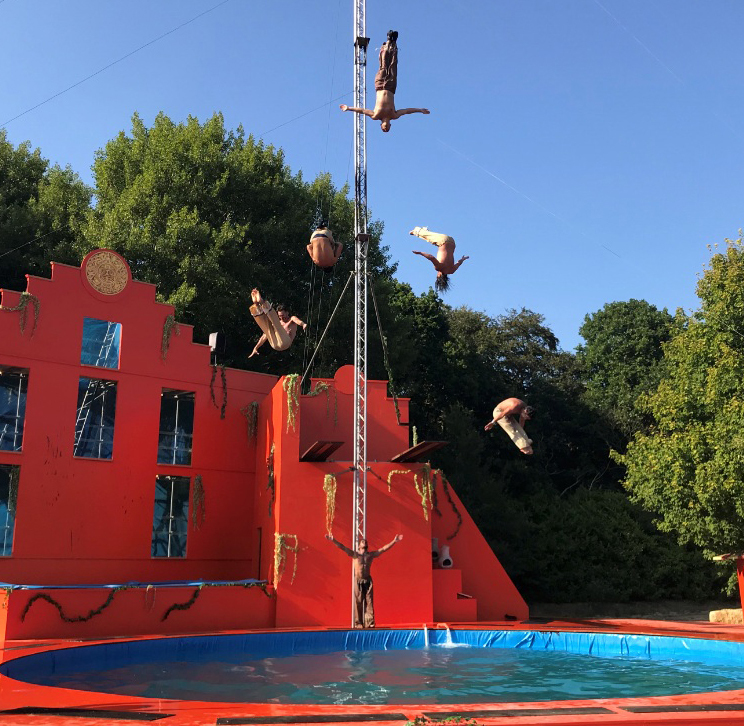 The high dive show will run daily at Pleasurewood Hills until 2 September with three shows each day. Entry to the show is included in the general park admission.